To create communities of competent massage therapists devoted to serving the greater community, enhancing and harmonizing our shared human experience through intention, integrity, and acceptance. 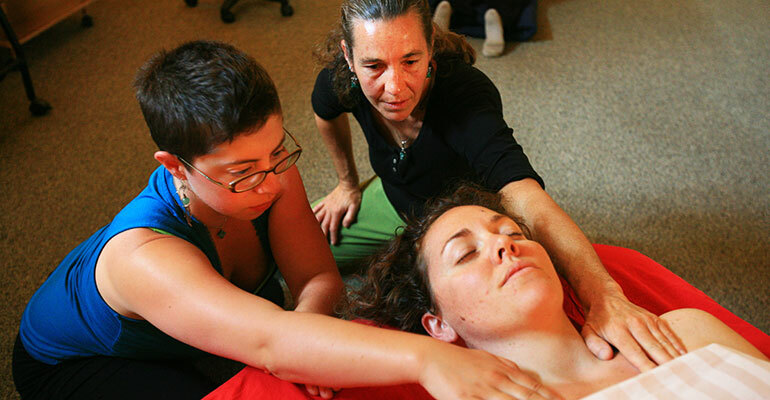 Guided by our belief that a mindful, holistic education creates a mindful, holistic practitioner, Ashland Institute of Massage integrates body, mind, and heart in the educational program. We honor the essential spirit in each of our students and support individual interests and paths. We are committed to developing professional massage therapists who hold highly the values of integrity, respect, compassion, and curiosity. We believe massage has the potential to deepen connection and provide healing for the therapist, client, and community. We are committed to maintaining a culturally creative learning community comprising individuals with diverse backgrounds, beliefs, and interests. We are committed to creating a space for learning and growth that is safe, fun, and interactive. Our AIM is for you to acquire awareness, integrity, and meaning in your studies, practices, and lives. Possessing technical skill, understanding the human body, and practicing from a space of personal awareness and presence are crucial characteristics of a competent practitioner. Our school values equally the development and integration of each trait. You will experience this integration through a thoughtful balance of kinesthetic training, academic preparation, and awareness exercises. We recognize that everyone arrives with differing learning strengths, and we are committed to applying multiple teaching strategies to accommodate different learning styles. We approach instruction with multidimensional activities (e.g., auditory jingles, kinesthetic exercises, and visual aids). We are an intentionally small school focused on the individual learner, and we believe smaller class sizes facilitate better learning. We enroll a maximum of 22 full-time students in each program so we can maintain a 1:7 faculty-to-student ratio in hands-on classes. We provide a safe, supervised, and supportive learning environment that promotes your health and well-being while encouraging you to achieve a high standard of excellence. We build our curriculum so it flows in a comprehensive manner. Integrating science and hands-on classes allows you to interweave your understanding of theory and practice. We are a group of dedicated instructors and staff who are passionate about what we do. As practitioners in our fields, we bring the liveliness of our practices into the classroom. We believe the best kind of learning happens with humor in a fun and relaxed environment, which means our classes are enjoyable and engaging! We strive to be a valuable member of the larger community and, as such, have a responsibility to put our values into practice. We are environmentally responsible in our business practices, seeking to create a minimum of waste, composting, recycling, and using recycled products wherever possible. We seek to bring massage to underserved segments of our community by volunteering at local businesses and organizations. We support practitioners in broadening their skills and knowledge through relevant and inspiring continuing education programs. We work to increase the understanding of the health benefits of massage through community education. We value openness, feedback, and change as vital to our growth and development as an institute.